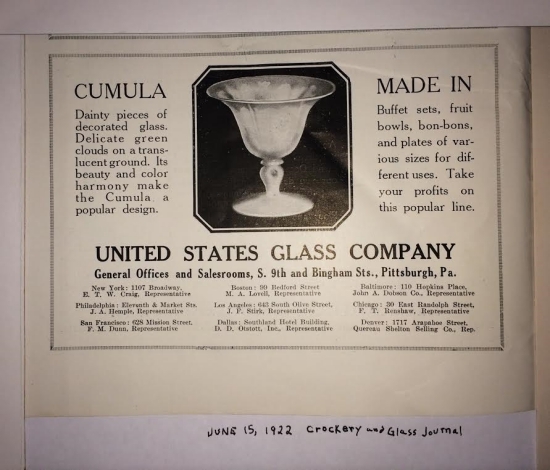 Cumula – A Stretch Glass Pattern? Isn’t Cumula a type of cloud? Yes it is; big white puffy clouds that are full of water. The West has been in a draught for at least four years. So the sight of cumula clouds is a big deal. But through the last four years, the cumula clouds would appear and then just keep on going right over us. Tuesday, these clouds appeared; Wednesday it rained all day long – a nice gentle soaking rain that we so desperately need. Thursday morning, it is very quiet outside and we pulled the drapes open to greet the new day- a white day with a high of 23’! Just had a terrible thought, we have to go into town for some appointments? That means shoveling snow. Shoveling snow not only to get the car out of the garage; but clearing a path for our short legged dog to do her “business”! The things we do for those we love!!!! Then came an unforgettable change in events like you see on the weather channel on TV only they were taking about US!!!! Yes US!!! Went from 2 feet of snow to a warm steady rain which didn’t stop when the snow was melted; just kept coming down (7.2” in 12 hrs.) Normally we are lucky to get 7” of moisture in a good year. Three weeks ago to the day. When the firemen came around the first time; we waded across the front yard to greet them and the water was up to my knees; can’t help that I have short legs. The captain ordered a palate of sandbags for the garage doors (of course our cars were in the garage like all good cars should be). He also ordered a rescue boat for the desert? He said to go get our things together. What things is he talking about? Rounded up clean dry clothes, what little cash I could find (Yes, had the PayPal # as well as the password- hate those passwords can’t ever remember the right number for the right account)? Got all of Sweet Pea’s stuff (our cute mutt with a mind of her own!). Opts – the lady on the weather channel said that I needed Sweet Pea’s shot’s dates; now doesn’t everyone keep their dog’s shot history right by the front door? She also said that we will need our passports; why is our town now in a foreign country? The TV lady now said that we will need our marriage license; why? No one bothers with marriage nowadays!!! Russell came in from trying to seal up the garages. I lost it when he asked which piece of glass do we want to take with us??? No we did not even come close to agreeing. We decided to stay home; we would go down with our house (Ship). But I did keep our stuff by the front door for a couple of days! I’ll rationally get everything together before the next storm which is supposed to hit later this week. Stay tuned for our saga…..Thank you to everyone who sent good wishes to us and all of the wonderful phone calls on the cells (lost phone service right after I sent the article over). Special thanks to Brian and Dave (BugDoc). Didn’t completely lose our power, but sure had a bumpy time of it. 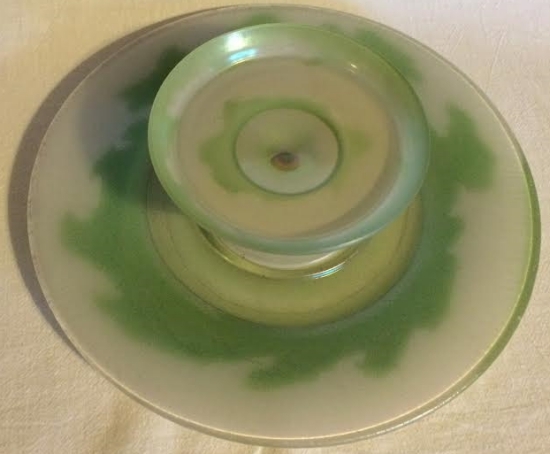 Those of you with a good memory, will remember BugDoc’s article a few months ago about United States Glass Company producing several very distinctive patterns in Stretch Glass. One of these patterns is Cumula. The piece is crystal glass with the clear stretch finish on the top. 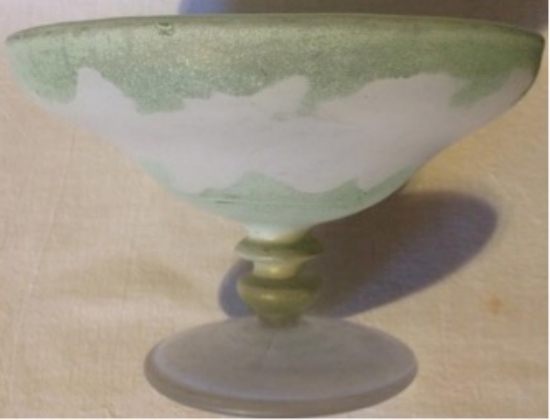 The green paint is randomly painted on the underside of the piece usually around the edge and base. Then white paint covers the entire underside of the piece including the green part. 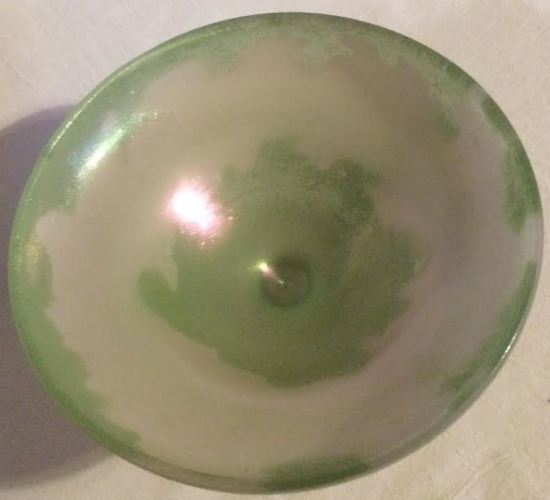 When you view a piece from the underside, it is all white even though you can see the green paint shadowing though. When you look inside the piece, the rainbow iridescence glows with the solid background. Have seen several pieces where the paint must have been scratched because all of the paint has been removed, but you can still see a silhouette of the outline of the green paint. Which means that the paint was fired on. On a dark background the iridescence will glow, but on a white or light background the iridescence is lost. The cumula pattern only comes in the green and white combination of colors; no we don’t know why the colors are in green and white and not blue and white! 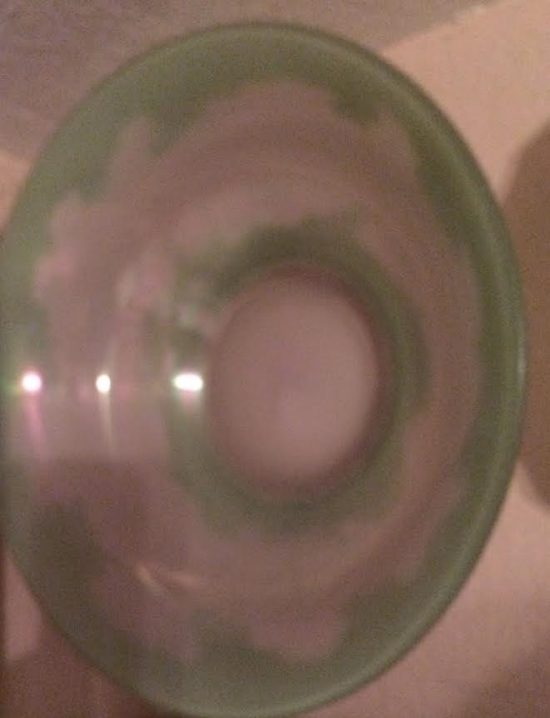 Has anyone seen this pattern in another color? They have another pattern with a dark blue paint around the edges that fade into white. The back coloring is the same as the front side. No we don’t know the name of that pattern. When someone develops a time machine maybe they will ask the U.S. Glass Company the questions.